I realize full well that I’m not the first person to enlist Pastner for this particular duty. Ken Pomeroy has already chuckled appropriately over how the Tigers’ December 1 win over Oklahoma State in Orlando somehow transformed Pastner overnight from a good recruiter forever doomed to be outclassed on Xs and Os into a rising star of the profession. Ken’s riled about how this reflects on the primitive state of coaching evaluation. I’m miffed about that too, but in this instance I’ll go Ken one better. I’m riled that Pastner was getting a bad press when even the primitive tools we do have suggest he may well be a very good coach. I am not holding up winning percentage as the end-all and be-all. Certainly Pastner received a Memphis program that in his first year was in better shape than what John Calipari inherited. Arguably the Horizon League that Brad Stevens faced in his first four seasons was not particularly robust. And clearly the win totals can be skewed this way or that simply by a coach’s preferences in the area of non-conference scheduling. Pastner may not be the third-best coach out of this group, but he does swim happily in the same statistical water with the rest of these very impressive and professionally successful coaches. News flash, Stevens had a pretty good start to his career. Coaches either catch March lightning in a bottle in their first four seasons or they don’t. (And even the ones who do can’t conjure up the magic every time. Ask Stevens about the 2009 tournament, or Smart about the last two Marches, or, well, you know what to ask Few about.) The lightning has very clearly eluded Pastner, of course, but it also evaded Calipari at Memphis, Steve Alford at New Mexico, and Gregg Marshall at Wichita State. It is well documented that Memphis has a poor record against top-25 opponents under Pastner. 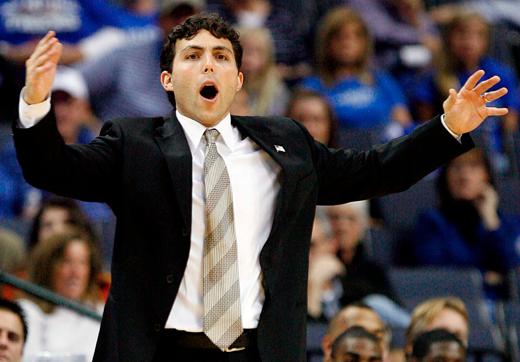 The interesting question to me, however, is whether there’s really something inherent to Josh Pastner’s coaching ability that explains — better than any other factor — that lack of success. Maybe we will look back someday and say yes, indeedy, Pastner was a “bad game coach” and that’s why he lost a bunch of games to good teams . Or maybe we’ll look back and say he started out losing more of those games than would be expected and people leapt to the easiest and most visually congruent explanation for a young coach. Calipari, Bill Self, and even (gather around, youngsters) Mike Krzyzewski were all castigated in their respective days for an alleged inability to win the big one. (Curry Kirkpatrick once called Coach K’s program a bridesmaid. I read a lot of SI growing up.) By no stretch of the imagination am I lumping Pastner in with the likes of those guys. But you should know that the Memphis head coach’s career falls very comfortably in line with what other non-Brad Stevens coaches on the way up have done at their mid-major stops. Perceive accordingly. This entry was posted in counting things, florid historical references, hoops, HR for athletic directors on December 17, 2013 by johngasaway.